What is a prefabricated home? In a nutshell, a "prefab home" refers to several different types of building systems in which a home is partially or entirely constructed, manufactured, or assembled in a factory, assembly plant, or lumber yard. While early prefab homes were simple, today's prefab homes are customized to suit their buyers' needs, and can be very elaborate. Today's prefab homes are available in all kinds of floor plans with all kinds of detail, depending upon buyer preference. Prefabricated houses around the world are built with a variety of methods, but are all beautiful, energy efficient and built with many new technologies. By Sheri Koones, Contributor. Forbes. Monday, 18 Feb 2019 11:53:00 -0500. You've heard of prefabricated homes. Now, developers in California are using that concept to prefab whole apartment buildings as a quick-build solution to the state's housing squeeze, the New York Times reports. CNBC. Friday, 08 Jun 2018 22:06 GMT. Why would someone choose a prefab home over a stick-built home? Prefab homes have greater energy efficiency, produce less waste during the construction process, are considerably faster to build, and are built using techniques designed to promote their strength. Most manufacturers of prefab homes offer options that allow home buyers to customize their house plans. There are several different systems that fall under the "prefab" definition. These include modular, panelized, and log homes as well as timber frame, concrete, and steel frame homes. Of all prefab homes, modular homes arrive on site the most complete. Modules, which are basically boxes, are built at a factory and then shipped to the site by truck. Because of the shipping process and the fact that the boxes have to be lifted on cranes, the modules are constructed to be particularly strong. Today's modular homes come in a variety of sizes and can be custom built. Panelized homes comprise wood panels built out of 2 by 4 lumber or structural insulated panels. Complete wall, floor, and roof segments are shipped to the location, where they are put together like a large puzzle. 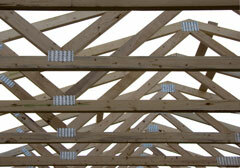 Panels can be used to build an entire house, or just part of it, like a roof truss. While log homes have been around for centuries, today's models bear little resemblance to the log cabins of pioneer times. 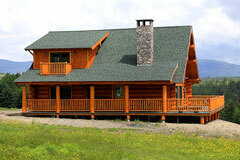 Most of today's log homes are built in a factory, and then assembled on the home site. Some of the logs are handcrafted, while others are milled. Timber-frame homes feature exposed posts and beams and high ceilings, and most of today's timber-framed homes are built in a factory. Timber-frame homes use computerized measuring and cutting equipment to get the pieces just right. 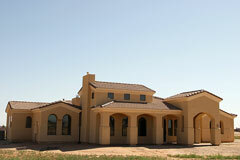 While concrete homes have been built in Europe for years, they are not very popular in the United States. About 16 percent of homes in the United States use some sort of prefab concrete panels. While concrete can be somewhat costly, it is widely available, easy to make, weatherproof, and incredibly strong. Concrete is also very energy efficient. Steel prefabricated parts are being used more and more. A good alternative to wood, homes made with steel prefab parts are stable and resist weather-related damage, fare better in fire, and have fewer concerns when it comes to pests. While all of the above construction falls under the banner of prefab, many of today's houses are built using a combination of systems. Using a combination of building systems means that design and construction process variations are limitless. For more information about prefabricated home building systems and prefab home builders, please visit the National Association of Home Builders' Building Systems web page. 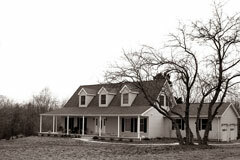 Buchanan, M. (2004). Prefab Home . Salt Lake City: Gibbs Smith. Koones, S. (2006). Prefabulous . Newtown, Connecticut: Taunton Press.